NetAcquiredelivers real-time telemetry processing solutions that work on the first day! With NetAcquire SIO™, just plug in your telemetry signal and a network cable. That’s all it takes, the system is up and running! A NetAcquire SIO system can be as small as toaster that will read serial or analog telemetry signals and publish the data to any Ethernet network. Save time, save hassle. You use a regular Web browser from any computer on your network to set parameters and retrieve data — it even works over the Internet. Not only are these systems easy to use, NetAcquire products offer Web-enabled telemetry solutions at a fraction of the cost of other equipment. Save your budget dollars but still get the quality, reliability, and results you need. NetAcquire products are versatile. They work with any data source, including spacecraft, aircraft, or industrial. 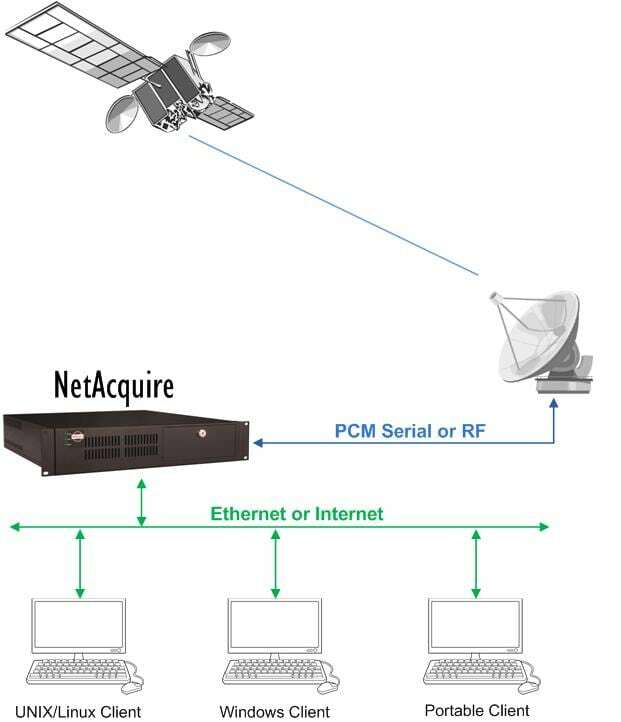 NetAcquire system configurations process serial, analog, and digital data in almost any format. Shrink your equipment requirements by letting NetAcquire SIO perform all of your telemetry operations in a single box: bit sync, frame sync, decommutation, processing, storage, and network communications. NetAcquire solutions are customizable to meet your needs now and in the future. Field-upgradable options include decommutation, data format conversion, time tagging, custom processing and many more. Fully-selectable serial bit rate, word width, encoding, alignment, and synchronization. Telemetry is published to any number of network machines. Java applets or Windows software provide real-time telemetry display. No software installation required; just use a Web browser. Change all communication parameters remotely in the field. Perform real-time processing without programming. Perform decommutation with the NetAcquire Decom Option. Publish some or all data to a network in real-time. Selectable local disk archiving for maximum data integrity. On-board telemetry simulator, create an output data pattern or use a recording. Password-protect access to configurations and data. support redundant and backup configurations. Create custom GUI displays of your data with the NetAcquire Java Client Toolkit or NetAcquire Windows Client Toolkit. Develop your own server extensions with our open programming environment. On-board decommutation with the NetAcquire Decom Option and Network Publish/Subscribe.